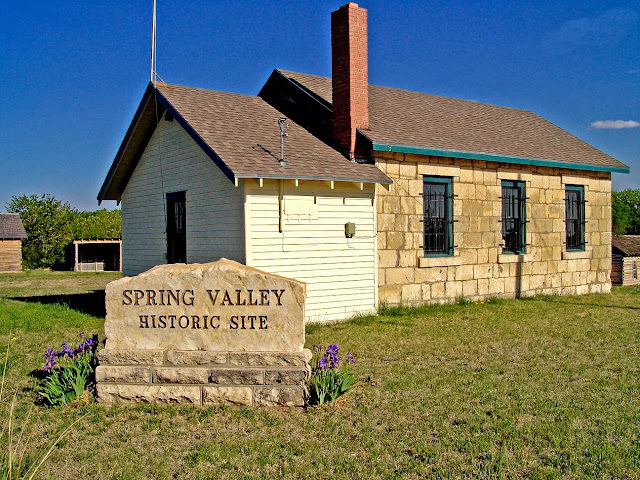 Location: Spring Valley Historic Site is located at the junction of K-18 and Spring Valley Road. School District #21 was legally begun on November 27, 1871. 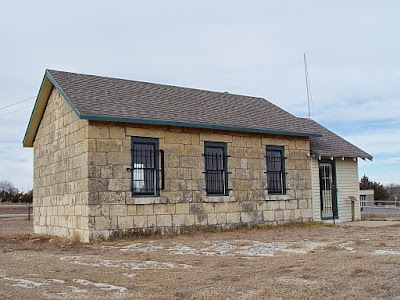 The first school building was a small frame building located north of Highway 18 on the flat just west of the junction City Stone Company. On March 27. 1873 the annual meeting was held in the schoolhouse. At that time John W. Bailey, and his wife Harriet, gave an acre of land for the location of a new structure south of K-18, on the present site. The date is marked in stone over the doorway to the school proper. The district operated for 87 years. School was discontinued here at the end of the school year in 1958. There were 8 pupils enrolled that year. 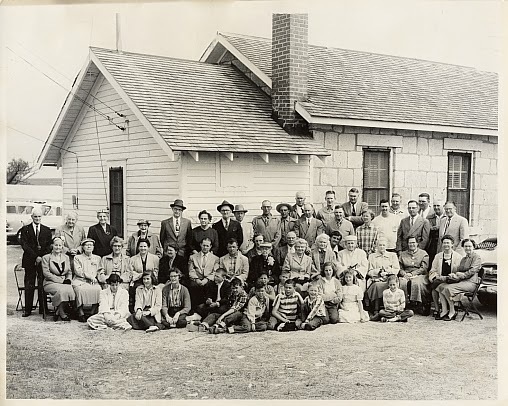 In 1957 it was the only rural school in Geary County without water and inside toilets. 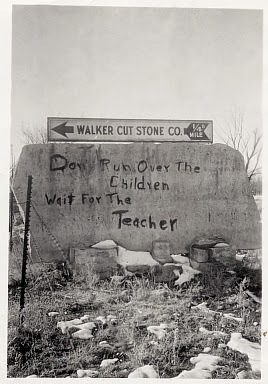 The cost of the school at that time was: $231.75 paid to Thomas York for stone work, $224.00 to C. N. Gray for carpenter work, $25.00 for finish carpenter work, $30.00 to William Clapp for plastering, $1.50 for the blackboard, $17.40 for a stove drum and piping, and $9.70 for school furniture. Mrs. Bailey was paid $1.50 for cleaning the school house. Clarence Greeley was hired to teach for $28.00 a month. Beginning November 3, 1873 the term was 3 months. School terms increased to 5 months, then 6 months and finally to 8 months. The school did not have its own water supply in the beginning. Water had to be obtained either south at a spring or across the highway north to another spring. Boys were assigned the task of bringing in the water and coal each day. The coal was used in the stove for heat. The coal shed had been a small barn for shelter of the ponies ridden to school by some of the students. The stone foundation and cement floor is still on the southeast portion of the grounds. A pony barn has once again been erected over the foundation. There was no electricity to the school in the early days so illumination was provided by oil lamps and lanterns. 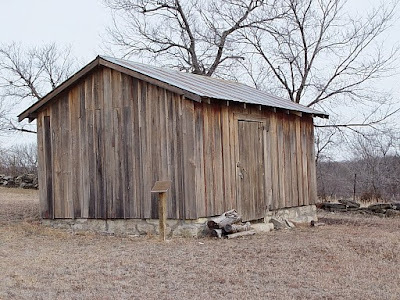 The barn as it appears today on the coal shed foundation. In 1908 screens were added to the outside of all windows to protect them from being broken. (Recess seemed to be hard on windows.) A fence was built around two sides of the school grounds in 1934. It was left up to the board to determine the type of fence. An original stone fence to the east can still be seen. The exterior picture of the school on the left shows a vestibule that was smaller and slightly different shaped than the present one. The vestibule is on the north side and was most likely replaced around 1939. The well was drilled in 1939 and the hand pump was installed at that time. The pump is still operational on the grounds. Playground equipment didn't appear on the school grounds until 1929. That summer the school board installed swings, a merry-go-round and a teeter. An early view of the school Year Unknown. The Spring Valley School has been restored and is still in use today by teachers bringing their classes out to give students a taste of what school was like in years gone by. To arrange for using the school contact the Geary County Historical Society. Besides the school, there is also the pony barn and a period cabin furnished as it would have been back when it was first built. 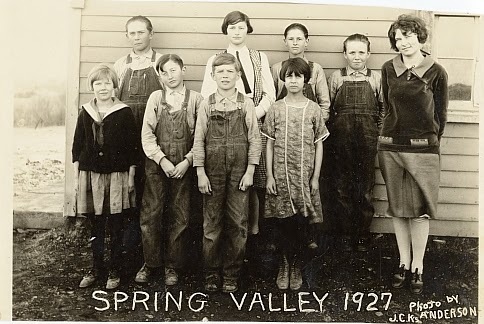 A Spring Valley School reunion at the school on April 27, 1958. 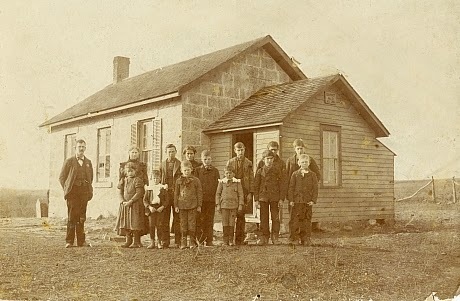 A class at the school taken in 1927. 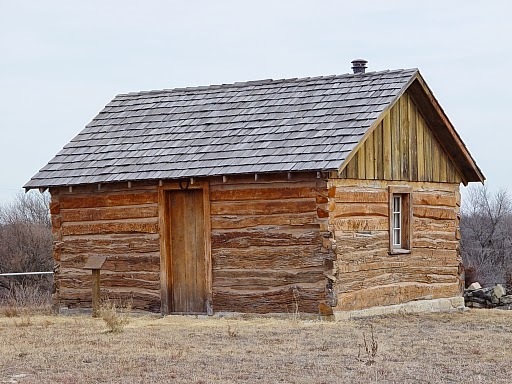 The period cabin on the grounds. A school prank done across K-18 and which still can be seen today. Photo taken in March, 1953.